Atom Yarjanian is the personification of the poet as hero, who speaks the truth as he sees it and is persecuted for his vision. Born in 1878 in Akn, Western Armenia, Yarjanian grew up in the shadow of the persecution of his native people. His family was upper middle class, which allowed him to attend the finer schools, including the Nersesian Institute, where he first developed his interest in poetry. That interest was encouraged by the school’s headmaster, who gave him the nickname that he would later take as his pen name, Siamanto. In 1891, his family moved to Istanbul (Constantinople), where he attended the Berberian Institute. He graduated in 1896 at the age of 18, a year that was marked in blood for the Armenian people. On August 26, a group of Armenian dissidents raided the headquarters of the Ottoman Bank in Istanbul. They killed the guards and took 140 bank employees hostage in an attempt to highlight the plight of their people and demand the rights that were promised the Armenian people years earlier. In response, Sultan Abdul Hamid II ordered a bloody pogrom that is estimated to have killed between 80,000 and 300,000 Armenians. Yarjanian and his family fled Constantinople along with many other Armenian intellectuals to escape the butchery. The escape did little to lighten his mind, though, and during his years in exile, his writing celebrated his people and mourned their fate at the hands of the Ottomans. He attended the Sorbonne in Paris, working various odd jobs to support himself, and developed ties to other well-known Armenian personalities both in and out of France. He eventually left Paris for Geneva, to join the staff of The Flag, an Armenian newspaper published outside Armenia where it could freely criticize the Ottoman Empire and focus international attention on the plight of the Armenian people. His first published poems were printed in The Flag under the pen name of Siamanto. His poetry was always highly nationalistic, and called for a free Armenia with no persecution. Between 1904 and 1909, he traveled extensively throughout Europe, living in Zurich, Paris, Geneva and other cities. His published works included Heroically, Armenian Children, Torches of Spiritual Behavior and Hope, and My Friend’s Bloody News, all volumes of poetry that reflected the spirit of a people under the heel of bloody oppression, celebrating their heroism while mourning the deaths and pain in which they lived their daily lives. In 1908, Yarjanian returned to Constantinople along with many of his fellow expatriates, hoping that the change in government in the Ottoman Empire meant that things were truly changing for his people. Instead, the continued persecutions again forced him to flee his beloved home for his own safety. He moved to the United States in 1910, where he immediately join the staff of the Homeland, an Armenian newspaper published in the US. He never lost his longing to return to his homeland, however, and in 1913, he returned, not to Constantinople, but to Tbilisi. On April 24, 1915, Atom Yarjanian was among the nearly 250 Armenian intellectuals who were arrested in a swift move meant to cripple the spirit of the Armenian people. 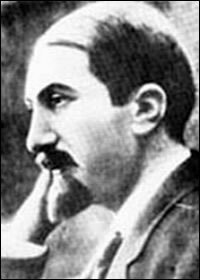 Siamanto, the heroic voice of the Armenian people in exile, was detained until August, when he was executed.